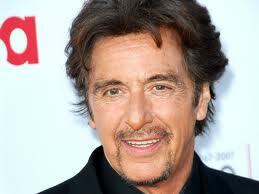 Pacino, 72, has long been considered one of the best actor’s in film history. Looking remarkably young, he’s in Beverly Hills to promote his latest movie, Stand Up Guys, directed by Fisher Stevens and stars alongside Christopher Walken and Alan Arkin. Charming and engaging, he’s dressed casually in jeans and a navy blue shirt and acts and looks a good two decades his junior. The multi-award winning actor is most famous for playing mobsters including Michael Corleone in The Godfather trilogy, Tony Montana in Scarface, as well as other dramas such as The Panic in Needle Park, Serpico, Dog Day Afternoon and many others. Although he has never married, Pacino has had several relationships with actresses and has three children. The eldest, Julie, born in 1989, is his daughter with acting coach, Jan Tarrant. He has twins; a son, Anton and daughter Olivia, born in 2001, with actress Beverly D’Angelo, with whom he had a relationship from 1996 to 2003. He also had a relationship with Diane Keaton, his co-star from the Godfather trilogy. Other relationships include Tuesday Weld, Marthe Keller, Kathleen Quinlan, and Lyndall Hobbs.